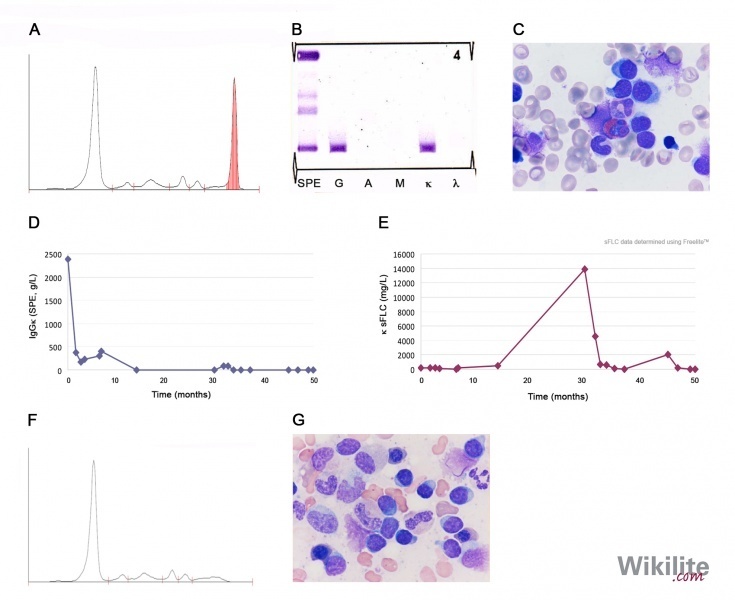 International Myeloma Working Group (IMWG) guidelines state that serum monoclonal proteins (including intact immunoglobulins) should be quantified using scanning densitometry on SPE (or capillary zone electrophoresis [CZE]) (Section 17.4) . If monoclonal protein quantitation by SPE is not available or considered to be unreliable during follow-up (e.g. 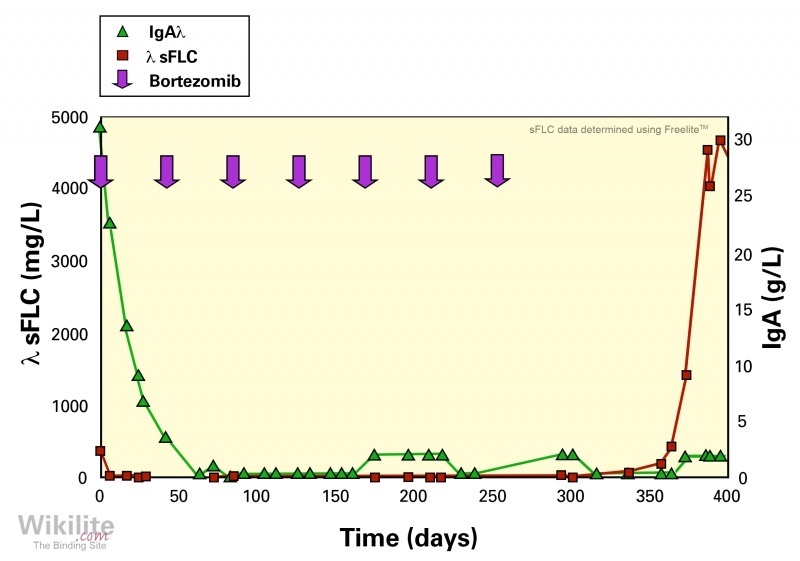 in patients with monoclonal IgA migrating in the β-region), then quantitative immunoglobulin assays performed by nephelometry or turbidimetry are recommended . Monitoring patients with oligosecretory disease (defined as a serum monoclonal protein <10 g/L and a urine monoclonal protein <200 mg/24 hours ) presents a significant challenge to laboratory staff and physicians. However, sFLC measurement provides a quantitative assessment of response in more than 70% of patients  and its use is recommended in international guidelines . Clinical trial protocols often allow inclusion of oligosecretory patients with measurable sFLCs (e.g. IFM 2009-02  and IFM/DFCI 2009 NCT01208662). 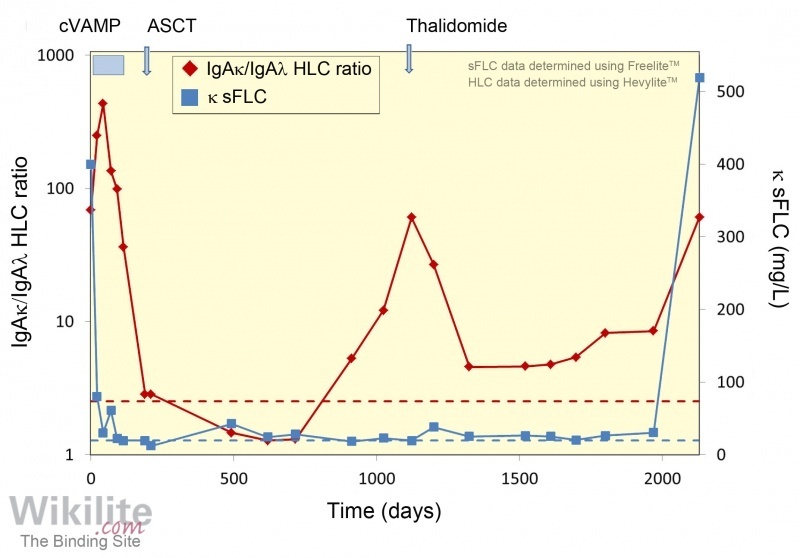 In addition, sFLC analysis is required in all patients with IIMM in order to detect relapse with free light chain escape (FLC escape) and define a stringent complete response (sCR) . These uses are described in more detail below. Figure 18.4. sFLC concentrations in 54 patients with IIMM whilst in complete remission, both clinically and by serum and urine IFE. An abnormal κ/λ sFLC ratio indicates residual disease in a proportion of IIMM patients classified as having achieved a complete response (CR) (Figure 18.4) . This has led to the incorporation of the κ/λ sFLC ratio in the definition of a stringent complete response (sCR) in the International Myeloma Working Group (IMWG) response criteria for MM . In addition to the criteria for a CR (absence of monoclonal protein by IFE and <5% clonal plasma cells (BMPCs) in bone marrow aspirates), a sCR requires the absence of BMPCs by immunohistochemistry and normalisation of the κ/λ sFLC ratio . IMWG guidelines recommend that sFLCs are measured in all patients at suspected CR, in order to detect residual disease and therefore determine whether they have attained a sCR (Section 25.3.5) . Attainment of a sCR has prognostic significance, as it identifies patients with improved long-term outcome (Section 20.3.1) .